All Swing Productions – World-renowned classes, dances, workshops and performances w world champion & pros! Welcome to All Swing Productions! Our philosophy is to provide the joie de vivre that comes with the swing-era through entertainment and education! Whether you are a total beginner, want to learn a choreography or need entertainment for a wedding or event, or you just want to improve your dancing— you’ve come to the right place. 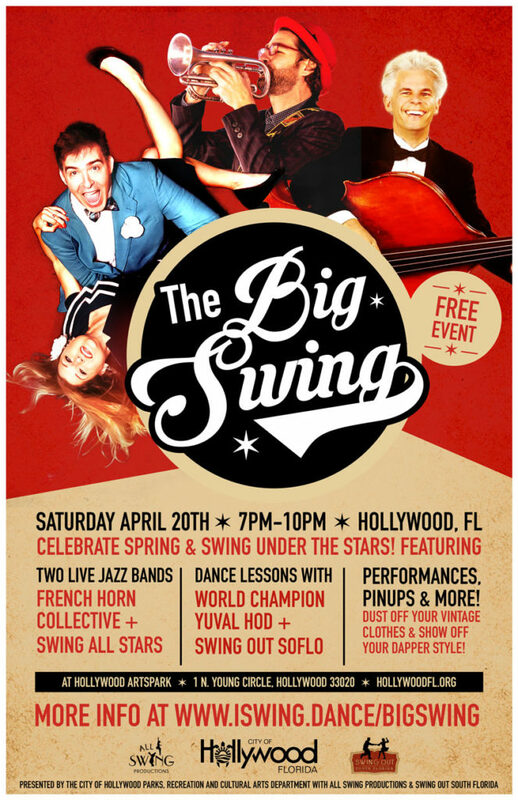 Currently based out of Miami, World Swing Dance Champion Yuval Hod and Pro Gypsy Juls teach and perform around the world. New Swing Social This Thursday! New Thursday Swing Social (and it’s free!) 💃🌮🍹 Come to the official kickoff of a new monthly dance at 222 Taco with DJs Juls, Izzy and Alex spinnin swingin tunes all night!!! 🌮🍹Extended Happy Hour Menu until 9PM 🎶 DJ booth playing some swingin’ tunes ❄️They’ve got the A/C crankin! 💦 Free ice cold water 🕺💃 Room to dance 🚘 Lots of free parking 🤯 FREE entry! All Swing Digital Gift Cards are ready to send, instantly! Good for All Swing private lessons, group classes and workshops. Listen & Follow us on All Swing Radio!